Less than two weeks before Election Day, voters remain skeptical that either Clinton or Trump would make a good president; and there has been no improvement in views of their potential presidencies over the course of the 2016 campaign. 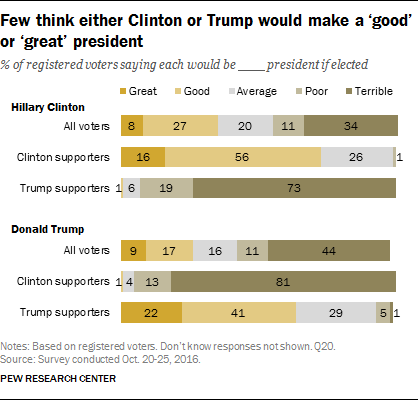 Just 35% say that Hillary Clinton would make a great (8%) or a good (27%) president, while 20% say she would be average and 45% say she would be either a poor (11%) or terrible (34%) president. Views of a possible Donald Trump presidency are even more negative: 56% think he would be either poor (11%) or terrible (44%), compared with 27% who say he would be a good (17%) or great (9%) president (just 16% say he would be average). Opinions about Clinton and Trump as possible presidents have changed little over the course of the 2016 campaign, and voters’ expectations for either candidate are no more positive today than they were in January. Clinton and Trump supporters have positive views of their candidates as potential presidents, but few think they will make great presidents. Just 16% of Clinton supporters say she would be a great president, while 56% say should be good and 26% think she would be average. Among Trump supporters, 22% say he would make a great president, 41% good and 29% average. Nearly six-in-ten (59%) say Clinton is hard to like, while almost as many (56%) say she possesses poor judgment. Even greater shares describe Trump as hard to like (70%) and having poor judgment (65%). While these views are very negative, voters also refrain from rendering positive judgments on Clinton and Trump on some traits – particularly when it comes to their honesty. Just 33% of voters describe Clinton as honest, while slightly more (37%) say this describes Trump. On several traits and characteristics, Clinton is more highly regarded than Trump. But Clinton’s own evaluations are not all that positive. About half (49%) say she is a good role model, which is nearly double the share saying that about Trump (25%). Fewer than half say Clinton is moral (43%) and inspiring (42%), but only about third find Trump moral (32%) and inspiring (35%). Voters see Clinton’s major strength as her qualifications. About six-in-ten (62%) say she is well-qualified, compared with just 32% who say the same of Trump. And far fewer describe Clinton as reckless (43%) than say that about Trump (69%). Roughly half of voters say Clinton (52%) is “a strong leader,” while somewhat fewer describe Trump in this way (46%). The one characteristic that voters say Clinton and Trump have in common is patriotism. Identical percentages describe each as patriotic (61%). In October 2008, many more voters viewed both Barack Obama and John McCain as honest than say that about Clinton and Trump today. Eight years ago, majorities described Obama (63%) and McCain (61%) as honest; fewer than four-in-ten say that about Clinton (33%) and Trump (37%) now. In addition, while majorities say Clinton (56%) and Trump (65%) have poor judgment, fewer voters faulted Obama (29%) and McCain (41%) for poor judgment in October 2008. On the question of “reckless,” there is no direct comparison to 2008; respondents were asked if Obama and McCain were “risky.” At that time, 49% said Obama was risky, which is somewhat higher than the share who calls Clinton reckless today (43%). Trump is widely viewed as reckless (69%); fewer characterized McCain as risky eight years ago. More voters say Clinton is well-qualified (62%) than said that about Obama in 2008 (53%). Qualifications were a strong point for McCain – 72% viewed him as well-qualified. Today, fewer than half as many (32%) say Trump is well-qualified. McCain, like Trump, got relatively low marks for being inspiring: 37% described him as inspiring, which is about the same share that says this applies to Trump today (35%). Obama was widely viewed as inspiring – 71% described him as inspiring in October 2008. Today, just 42% of voters say the same about Clinton. Among supporters of Clinton and Trump, substantial shares attribute positive traits to their own candidate, and few describe them negatively. But there are some differences between the two cohorts in how they think of their candidate. Clinton supporters overwhelmingly say she is a good role model (90%) and well-qualified (97%). While a majority of Trump supporters ascribe the same attributes to him, they are less likely to do so than are Clinton backers: Six-in-ten Trump supporters say their candidate is a good role model, and 76% think of him as well-qualified. On the other hand, while 80% of Trump supporters think of him as honest, a smaller majority (67%) of Clinton backers say she is honest. Nearly half of Trump’s supporters (46%) say he is hard to like, while a third describe him as reckless. Smaller shares of Clinton supporters say she is hard to like (32%) or reckless (12%). While Trump supporters overall describe their candidate positively, views differ between Republicans and Republican-leaning independents who say they supported Trump in the Republican primaries, and those who say they supported another Republican candidate. With the exception of Trump’s patriotism, the gap is at least 30 percentage points across all characteristics. Republicans who supported him in the primaries are nearly three times as likely as those who supported another candidate (80% vs. 28%) to think of Trump as a good role model. And Trump primary supporters are roughly twice as likely as those who supported another primary candidate to think of Trump as well-qualified (89% vs. 46%) or as moral (85% vs. 40%). There are striking differences on certain characteristics of Clinton based on primary support as well. Just 40% of those who say they supported Bernie Sanders in the Democratic primary think of Clinton as honest, compared with more than twice as many (83%) of her primary supporters who say the same. While a majority of those who supported Sanders think of Clinton as inspiring (56%), they are far less likely to think so than those who supported Clinton in the primaries (86%). Though majorities of Democratic and Democratic-leaning voters who supported Bernie Sanders in the Democratic primary think of Clinton as moral (64%) and a strong leader (75%), these views are more widely held among those who backed Clinton for the Democratic nomination. Few Democratic voters think of Clinton as “hard to like,” still 42% of Sanders primary supporters see her this way, compared with just a quarter of Clinton primary supporters (25%). How well do the candidates understand the needs of voters? When it comes to views on how well the candidates relate to voters, more say Clinton than Trump understands the needs of “people like them” well. Overall, half of voters say Clinton understands the needs of people like them very or fairly well, compared with 39% who say this about Trump. More voters say Trump understands their needs not at all well (45%) than say this about Clinton (33%). Identical percentages of Clinton supporters and Trump supporters (88% each) say their own candidate understands their needs very or fairly well. Clinton supporters are somewhat more likely than Trump supporters to say the opposing candidate understands their needs not at all well (79% vs. 69%). There are demographic differences among both Clinton and Trump supporters in the share who say their candidate understands their needs. Voters age 50 and over who support Clinton are much more likely than supporters under age 50 to say Clinton understands the needs of people like them very well (56% vs. 26%). Just 24% of Clinton supporters who say they preferred Bernie Sanders in the Democratic primary elections say she understands their needs very well, compared with 58% of Clinton supporters who also preferred her in the primaries. There is no gender gap among Clinton supporters on this question: 41% of women and 40% of men say she understands the needs of people like them very well. Among Trump supporters, 57% of those who say he was their preferred candidate in the Republican primaries say he understands their needs very well; this compares with just 25% of Trump supporters who say they preferred some other Republican primary candidate. As is the case among Clinton supporters, supporters of Trump who are age 50 and older are more likely than those ages 18-49 to say he understands their needs very well (46% vs. 33%). About the same share of men (42%) and women (39%) who support Trump say he understands their needs very well. Voters express concern over both Donald Trump and Hillary Clinton’s ability to serve the country’s best interests, if elected. A majority of voters say they are very or somewhat concerned Clinton (62%) or Trump (59%) would have relationships with organizations, businesses or foreign governments that would conflict with their abilities to serve the nation’s best interests. 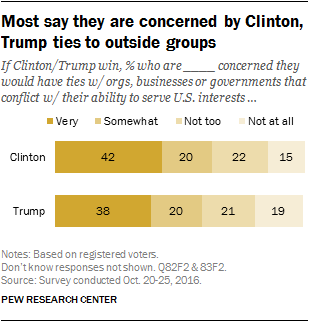 Fewer than two-in-ten voters say they are not at all concerned that Trump (19%) or Clinton (15%) would have conflicts of interest. 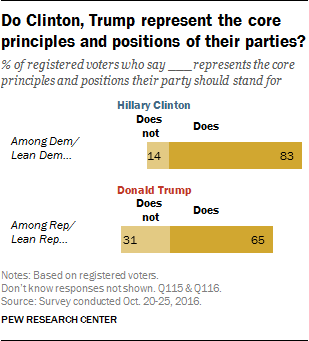 Democratic voters overwhelmingly say that Hillary Clinton “represents the core principles and positions that the Democratic Party should stand for.” About eight-in-ten (83%) say she does, while just 14% say she does not. Three-quarters or more of nearly all Democratic subgroups see Clinton as representative of their party’s core values and policy positions. On the GOP side, about two-thirds of Republican voters (65%) say that Donald Trump represents the core principles and positions of the GOP, while roughly three-in-ten (31%) do not see Trump as someone who represents what their party should stand for. Republican voters who have not attended or not completed college are more likely than Republican college graduates to say that Trump represents core Republican principles and issue positions (69% vs. 56%). The vast majority of conservative Republican and Republican-leaning voters see Trump as representative of what the GOP should stand for (75%), while among moderate and liberal Republicans assessments are more mixed (52% say that he does, 45% say that he does not). Primary support is strongly related to assessments about whether the candidates represent what their parties should stand for. In particular, among Republican voters many who did not back Trump for the GOP nomination say he does not represent the Party’s principles and positions. Those who supported Trump in the primaries widely see him as a representative for core Republican principles and positions (85%). Among Republicans who did not back Trump in the primaries, about as many say he does not (46%) represent what the Party should stand for as say he does represent it (50%). Among Democratic voters, more than nine-in-ten of those who supported Clinton for the nomination (94%) and about three-quarters of Sanders primary backers (74%) now say Clinton represents core Democratic principles and positions.